There are very few of us who haven’t fantasized about having a custom swimming pool in Katy, especially living in hot, humid, Texas. Sahara Construction & Custom Pools individually designs and builds every pool to meet our clients’ personal tastes and budget. Sahara’s elite pool design team, experienced crews, and professional pool contractors will completely transform your backyard into the outdoor living area of your dreams. Whether you are looking for our team of qualified professionals to design your custom pool from scratch and complete your new pool construction, or you moved into a house with an outdated pool, or maybe it just doesn’t fit your style or family, Sahara can design you a flawless, in-ground concrete pool. Whether it’s a pool remodel or new pool construction, Sahara Construction and Custom Pools is the pool company for you! Our pool builders will not stop at just a custom swimming pool for you and your family.. We believe that it all starts with a great design – one that incorporates both the swimming pool & spa, with all of the other backyard features such as landscaping, patios, barbecues, fire pits, etc. As you could gather from our 5-star rating and from the fact that we are an accredited company with the Better Business Bureau, Sahara Construction & Custom Pools will be a reliable, affordable choice in bringing your backyard dreams into a reality. Give us a call today and let a member from our team come out and give you a free estimate. Visit the Sahara Pool Builder Website Here! 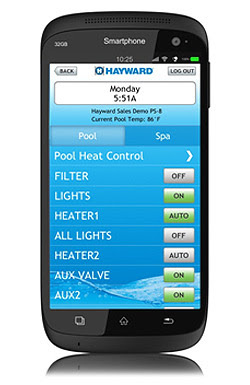 The Android app for Hayward’s Remote Pool Management Platform, AquaConnect, is now available on Google Play®. A popular accessory to Hayward’s ProLogic® and AquaPlus® residential automation systems, AquaConnect is already available as an iPhone® and iPad® app. Apple® and Android device users will now be able to easily monitor, control and act upon more than 100 pool and spa conditions, parameters and settings from anywhere. AquaConnect users have always had the ability to use their mobile devices to access their pools and spas, but the app makes it easier and offers faster access to the platform. The AquaConnect mobile app enhances the visual display on the users’ phones and tablets, and streamlines the process of reading diagnostics, adjusting settings, and turning features on and off. Interested in more information? Call (713) 634-9490 today, or fill out our free consultation request form and we’ll be glad to answer your questions.